Aww, best friends forever can be adorable but unlikely animal pairs. Interspecies BFFs show an authentic portrayal of acceptance and love. You can’t make this stuff up. These differing species are creatures which experience no prejudices and no fears toward each other. Unlikely yet too cute animal friends look beyond immense differences and across all boundaries. 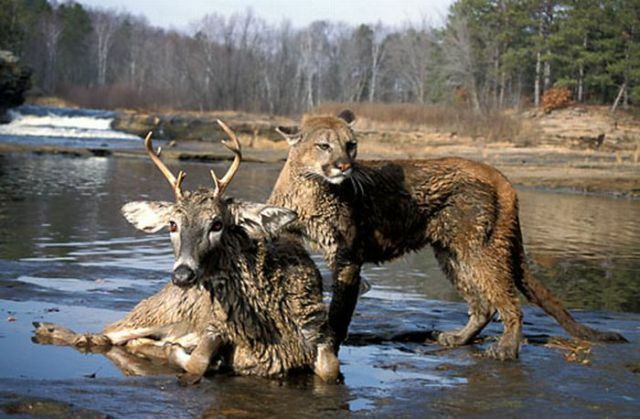 Here are many interspecies friends which might make you think aww or can’t we all just get along? This six-week-old cub is a liger, the baby of a male lion and a female tiger. The three dolphins and baby liger came nose to glass at Shenzhen Safari Park in Southern China, becoming fast friends. Ligers are the largest big cats in the world, growing up to 12 feet long. It’s a good thing they met while the liger was still a curious baby. Fins and fur, there is no prejudice only friendship. Interspecies friendships are somewhat common and definitely heartwarming. Anjana the chimp became surrogate mother to these two white tiger cubs, Mitra and Shiva. Twins are a handful for anyone, but this two-year-old chimpanzee has previously stepped in as a surrogate mother to other babies like lions, leopards and orangutans. The tiger mother became aggressive after a hurricane, so infant animal caretaker China and Anjana took over their care. Anjana and Mitra and Shiva formed this bond at TIGERS (The Institute of Greatly Endangered and Rare Species) in South Carolina. The chimp gave these cubs love and playtime as well as bottle fed them. Suryia the orangutan and Roscoe the Blue Tick hound became immediate best friends when they met at TIGERS in Myrtle Beach. They go around the preserve for endangered animals helping out in any way they can. When Suryia and Roscoe aren’t “working” then they spend time playing, swimming, and going for walks. When the former 8,700 pound Asian pachyderm retired from the circus, Tara was moved to an Elephant Sanctuary in Hohenwald, Tennessee. That’s where Tara and the dog Bella became inseparable BFFs. Not only is it an odd pair, but when Bella suffered a spinal cord injury, unable to move her legs or tail, her best friend Tara stood beside a gate outside the sanctuary office. Tara waited and watched for three weeks until Bella was carried outside for them to be reunited. Bella’s tail started to wag and the best friends forever stayed together until Bella could walk again. After a tsunami, survivor and 650 pound baby hippo Owen imprinted on 130-year-old tortoise Mzee. At Haller Park wildlife sanctuary in Mombasa, Kenya, Owen started following Mzee everywhere. The two became inseparable BFFs. As one-year-old Owen grew, the two lived, slept and played together. In a picture of perfect interspecies cooperation, they even created their own language. Using both noises and gentle prodding, they nudge each other and nod. Isn’t that something all best friends do? Debby Cantlon took over care of an orphaned newborn squirrel and named the baby Finnegan. Her pregnant dog, a Papillon, took an interest in Finnegan. Shortly before Mademoiselle Giselle went into labor, the dog pulled the squirrel’s cage next to her bed. When Finnegan was let out of his cage, Giselle invited the squirrel into her litter. Puppies and newborn squirrel all thought of Giselle as their mother. You might be thinking that this Royal Bengal tigress sees the six tiny piglets as bacon snacks. Amazingly, however, the tigeress adopted these piglets and took them under her paw as their unusual protector. They lived together at the Sriracha Tiger Zoo in Thailand. The suckling piglets might have wondered, “Are you my mother?” The tigress gave them every bit as much love as their mother by blood could have. Although not everyday common by any means, many dogs have taken in tiger cubs as their own “pups.” At the Safari Zoological Park in Kan, Isabella, a yellow lab, adopted three white tiger cubs. At Jinan Paomaling Wild Animal World in China, three newborn tiger triplets were adopted by Huani, a mixed breed farm dog. Huani had previously played surrogate mother to tiger cubs. In Japan, at Shirotori zoo, a French bulldog became BFFs with a 2-week-old baby Bengal tiger which had been rejected by its mother. Another dog at Changchun Zoo in China plays surrogate mother to two tiger cubs which are not much smaller than she is. At Warsaw Zoo, three-month-old tiger cub Zoya was rejected by its mother but became the best of friends with three-month-old Alsatian puppy Frida. Both the 5-month old orangutans and the endangered Sumatran tiger cubs were abandoned by their mothers. Caretakers at Taman Safari Indonesia Animal Hospital put them together. These orphans bonded. Dema the tiger cub and Irma the orangutan turned into best buddies. The fact that they love one another is obvious. Lion & Tiger & Bear – Oh My! This touching bond between Baloo the bear, Leo the Lion and Shere Khan the tiger started when they were barely two months old. They were rescued during a drug raid. The owner kept them a status symbol. Noah’s Ark animal rescue center in Locust Grove, Georgia, took in the trio. Eight years later, the three animals seem to believe they are brothers by blood. They play and eat and sleep together. Still bonded as brothers, Baloo the bear is now 1,000 pounds; Shere Khan is now a 350 pound tiger; and Leo the lion is also 350 pounds. Doesn’t it make you wonder, can’t we all just get along and be friends? Have you ever thought about adopting a dog? Even polar bears seem happier and more playful around canines. After Norbert Rosing captured shots of a 1,200 pound polar bear playing with a husky sled dog, it became viral. Yet that polar bear in Hudson Bay, Canada, was not the first and will doubtfully be the last unlikely friendship between bear and dog. On the right, that polar bear is giving a wolf and big love hug. Is nurture stronger than nature? In some cases, yes; this could easily be over with one tightening of the dog’s jaw. However, some dogs seem to adopt ducklings and chicks. Ben the border collie adopted an entire flock of ducklings at a farm in Devon, England. You see, it’s more than something odd in UK water causing animals to act this way. In China, Huahua the chihuahua is protecting the chick, not chowing down on it. Huahua “regards the chick as her baby and stands guard to make sure it comes to no harm.” People often give pitbulls a bad rap, but check out pitBull Sharky and his chicks. He even helped teach them to swim. In the video, you’ll see Snarky, a cat, and a pack a chicks all seemingly the best of friends. Wildlives, an animal rescue center, saved the sickly five-week-old runt piglet, Prudence, (not Babe) from being shot by her owners. Since the piglet was puny, they kept it close to the house where Prudence became part of a pack with six dogs. Before long, Prudence and Henry the puppy became tight. Prudence seems to believe she is a dog, jumping around, chasing and fetching sticks. Henry and Prudence curl up to doze with the other puppies in the pack. Here’s another unlikely friendship between a German short-haired tiger-cross dog and a joey. The dog, Rex, discovered a dead kangaroo on a Victoria, Australia, road. Rex rescued the surviving joey, took it home, and delivered the baby kangaroo to the owner. Rex then adopted the kangaroo and they became the best of buds. Gregory Pike and amazing trio became famous in a youtube video. It’s wild to see the three animal stacked on top of each other, a rat riding a cat which is riding on a dog. The back story of this street act includes Booger the dog who selected and raised Kitty. Booger thinks Kitty is her baby. Kitty treats Mousey the rat like a sibling. Although Mr. Pike went through a rough spell in the press, he also helps to show that we could live in a friendlier and more tolerant world. Dogs are called man’s best friend. Humans are not the only species with which dogs bond. 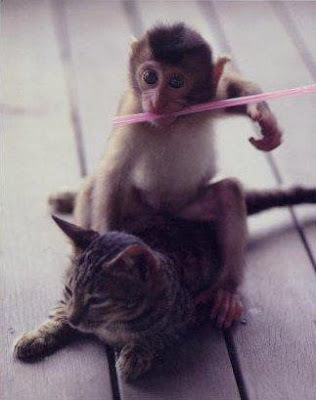 An 18-year-old capuchin monkey, Whiplash the cowboy monkey, rides his trusty sheep-herding steed. Bizarre to us perhaps, but neither the dog nor the sheep see anything to gawk at regarding their friendship. In fact, a Chinese Zoo gave an orphan monkey its very own guard dog to protect it from bigger primate bullies. I love you too, the dog seems to be saying as it slurps a big sloppy wet kiss on the donkey. A critically endangered Père David’s fawn was rejected by his mother and adopted by Geoffrey a golden retriever. You don’t need to be Dr. Doolittle and talk to the animals to see and understand the love. Fawns and surrogate dog parents seem to work well. Yet it’s not only dogs and deer which form this loving bond. There’s Billy and Lilly, another inseparable pair, after Billy the boxer adopted Lilly a 12-day old kid. You thought Bambi and Thumper was just a fairytale? This wild rabbit and fawn went from grazing in the same area to spending the winter together as BFFs. Not so quick to the warm fuzzy happily ever after, since the townspeople decided the fawn had grown and needed to be returned to the wild. The fawn was tranquilized and the images under the tree were taken as the deer was being pulled under by the drug. Unknown to either species, even while the bunny tried to hold up the fawn’s head, it was goodbye. Don’t you hate it when your best friend moves away? This dog did not run for safety during a house fire. In fact, he risked his life to save tiny kittens. It nearly cost the hero dog his life. The little 12-week-old macaque monkey was abandoned by his mother and close to death when a Chinese animal sanctuary rescued it. Although the monkey’s health improved, the little fella was spiritless until his friendship with a white pigeon. Natural animal instincts do not always kick in and some baby animals, like human baby species, don’t know prejudice until tainted and taught it. You can see the loving friendships between very different species. Peace is always an option. Make love, not war. This hairless cat and hairless rat can see they have more in common than most within their own separate species. It makes sense for them to bond and become best friends forever. Is it bizarre? You betcha, but anything is possible with a little love. Go hug somebody and make a new friend.